Plans are underway to launch the Winnipeg Bears Australian Football Club. And DUCW member Allan Sharman and friends are looking for 10 to 12 people to get the ball rolling. Men and women of all ages and abilities are invited to attend the first ever Aussie rules football practice in Winnipeg – Tuesday July 18 from 7:30 pm to 9:00 pm at River East Collegiate (295 Sutton Ave). Organisers are in regular contact with AFL Canada, and have also contacted the Irish Association to see if there are any Gaelic footballers about. “LIKE” their new Facebook page for all the information about the inaugural practice, as well as upcoming events. If you would like to be involved or are simply curious about the AFL, contact Allan at allansharman@gmail.com. This entry was posted in AFL, Australia, Events, New Zealand on July 7, 2017 by Jenny Gates. The September 2016 issue of the Southern Yarn is ready for you, and likely in the post or already in your hands if you receive it by mail. Click the image or follow this link to the PDF. Check out the Yarn page. This entry was posted in AFL, Yarn on September 12, 2016 by Hydesmith. The October, 2015 issue of The Southern Yarn is ready for you to view and download. Print it out if you like, even in colour on your own printer! 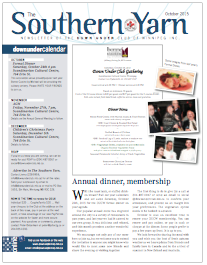 We’ve got details on the annual Formal Dinner and lot more to read. And if you have not renewed your DUCW membership, this is a great month to get that task done. Pay online or, even better, at the Formal Dinner. 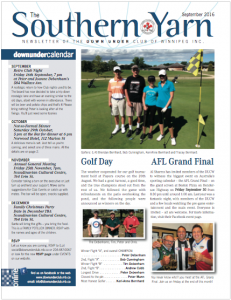 This entry was posted in AFL, Commonwealth Corner, Getting to Know, Membership, Yarn on October 6, 2015 by Hydesmith.